Pretty sweet, no? Gabrielle, 46, also let her followers in on how she and her husband, 36, are feeling. Spoiler alert: they sound all the way over the moon. "A LOVELY DAY," she captioned the series of photos. "We are sleepless and delirious but so excited to share that our miracle baby arrived last night via surrogate and 11/7 will forever be etched in our hearts as the most loveliest of all the lovely days. Welcome to the party sweet girl! #onelastdance #skintoskin @dwyanewade." 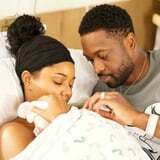 Dwyane and Gabrielle tied the knot in 2014, and Dwyane is already a father to Zaire Blessing and Zion Malachi with ex Siohvaughn Funches, and and Xavier Zechariah with ex Aja Metoyer. We can't wait to see more photos of their new baby girl!